We often feel hungry during the day, but we do not always have enough time for a proper meal between our errands, or we simply feel tired and want something sweet to recharge. What do we do? We eat some candies or take a few bites of a sandwich leave it on the table. Obviously, this doesn’t help our body or give us the energy we wanted. Natural Siberian cedar nutritional bars are made for such particular cases. They are not just cedar sweets, but a real storehouse of vitamins. “Ringing Cedars of Russia” bars are made in the remote Siberian Taiga forest from 100% natural products such as cedar nut cake, puffed rice and honey with nuts and dried berries. All ingredients in the bars are alive and contain bioavailable vitamins and minerals. Cedar bars are a real recharge of energy and health. School children love them, and have them as a snack during recess, gym. They help women take care of their figure and beauty, and are good simply for lovers of healthy natural sweets. Put a few in your handbag or keep some close – just in case! They are sweet, but do not contain any added sugar or its substitutes. Due to organic ingredients, honey, molasses or carob cedar bars have enough natural sweetness. Cedar bars satisfy your hunger. The body receives high-quality food due to the contained oil cake, rice and nuts.. They contain natural vitamins and minerals such as vitamins E, B and C, as well as proteins and organic fiber. Do not contain any preservatives, dyes, stabilizers and other chemicals. 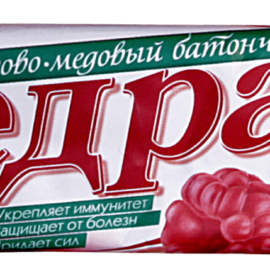 Cedar honey bar “Immunity” with cranberries and raspberries is rich in vitamin C. In combination with natural Taiga honey, this is a real shield against colds and viruses. Cedar honey bar “Youth” with almonds and sesame seeds is rich in vitamin E, beta-carotene and has strong antioxidant properties. It helps slows down the aging process. Cedar honey bar “Energy” contains a double portion of cedar nuts and has a high nutritional value, which quickly replenishes energy reserves. How to buy cedar sweets? Our full cedar bar range is available at megrellc.com. You can choose your favourite, or order all kinds to taste. Specify the number of bars (believe me, one won’t be enough) and add to cart. All of our payments are done via PayPal. Cedar bars are delivered straight to your door by DHL. megrellc.com is the the official online store of the product manufacturer. When you purchase here, you can be sure that you are receiving a package directly from our warehouse in Siberia. We also a guarantee the best price!